≧◉◡◉≦ It ALWAYS feel SO DAMN GOOD to have OFF days in SG. Really. There's no place like Home. "And in this Moment, I swear we're Infinite." Yes. This is also referring whenever I step onto the SG ground (i.e Changi Airport Aerobridge) HAHAHAHAHA! Lotte Koala's March is a bite-sized crunchy biscuit with Rich, Premium Quality cream filling. Each biscuit is imprinted with a koala character on its surface. There are a total of 200 Koala characters thus far. Koala Character born from LOTTE KOALA'S MARCH, is not just any koala character - it carefully retains its image as a character born from a cookie snack. Its aim is to offer those who see this character the simple delight that comes from association with a character drawn on a cookie. Delight in Koala’s March’s crispy biscuits filled with your favorite yummy flavors. And since that was my OFF day, I decided to bring this cutie along with me to meet my SUPER LONG TIME NO SEE GF of mine - Debbie! 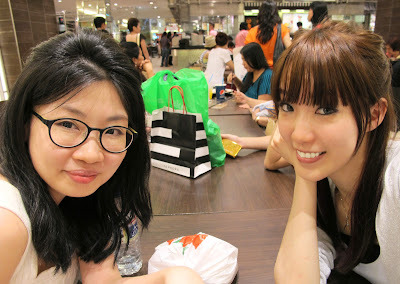 (っ◕‿◕)っ ♥ Time really fly by and both of us realise that it has been 5 FREAKIN YEARS since we last met! ._____." OMG. And OFF days in SG are never enough and soon, I'm off to my 2nd Home... Japan! Cheris's attempt to do the Choco Ball. WHAHAHAHAHAHAH! THIS IS SO EPIC!!! Both Cheris and I were watching this IG video showing how to crush the mini bears to become one HUGE Choco Ball. We tried... Ok Cheris tried and she shook the box like 1-2minute until her poor hand started to feel numb. And so we thought we had our Choco Ball... BUT TURN OUT the biscuits were still INTACT, not even crushed whatsoever! LOL! We had no idea to laugh or cry... So we did both. WHHAHAHAHAHA! Epic of the Night really. I thought my neighbour would have banged on my door to ask us to shuddup. LOL! Many thanks to OMY Singapore and LOTTE Koala's March for sending me these childhood goodies! Cheris, Myself, Yeong Jin & Se Young have enjoy these lil snacks very very much. More pictures coming up soon!